It might be hard to judge how much art there is in imitation, but Angelina Jolie certainly does this film justice as this is a truly good old-fashioned Hollywood tear jerking biopic in-line with some of the best of them. For whatever that’s worth is where the debate lies in for Unbroken. As it is, this is the true story of a triumphing American hero if ever there was one. 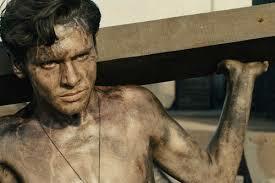 It’s lavishly done, expensive, and altogether a very ambitious epic about Olympic runner-turned-WWII bombardier-turned-POW “Louis Zamperini” (Jack O’Connell). While I’m sure there are many of them, this is, with all it’s harrowing moments, one story that should always be told and if any tale of survival deserves to be made, it is this one. 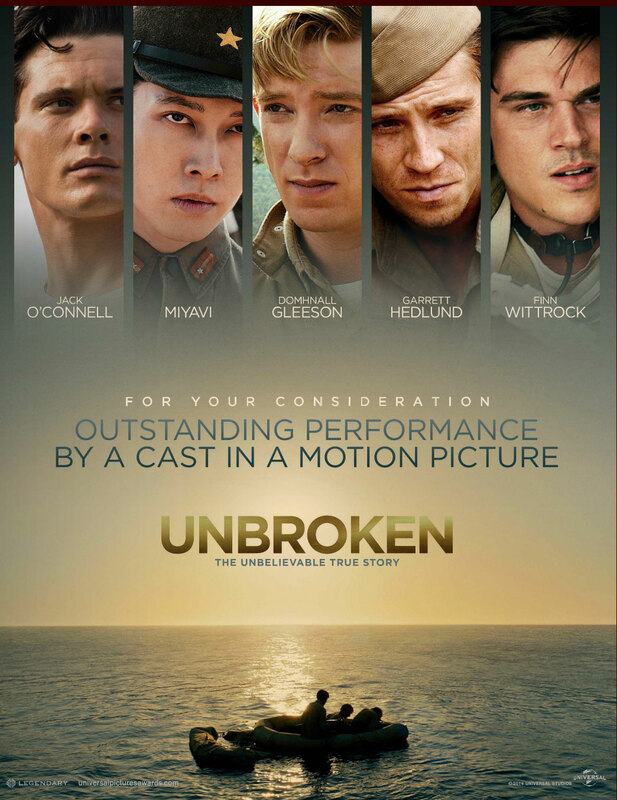 While there’s probably room for a much better movie here, as points of it do drag on..but Unbroken at least benefits from having one hell of a story to tell. Thanks to flashbacks, we see Louie as a kid (C.J. Valleroy), wasting whatever potential he has by shoplifting and hiding his stolen items in a secret spot where he sits by himself and drinks liquor out of a bottle painted to look like it contains milk. It’s made clear he’s thought of, especially in those times, as a juvenile delinquent of a child. Being an Italian immigrant didn’t help. Luckily, when being chased by a local neighborhood policeman one afternoon, he happens to do a sprint across the field during a school track practice, catching the eye of a friend and his own brother, “Pete” (Alex Russell) who convinces Louie to take up running as a sport. The main cast doesn’t have the support of any big name veteran performers, and that’s fine as the supporting cast, a lot of them in brief but pertinent roles, ranging from Jai Courtney “Cup”, Marcus Vanco “Lambert”, Ross Anderson “Blackie” and Garrett Hedlund as “Fitzgerald”, are all up to par here..but let’s just call it and say Jack O’Connell leads the bunch very well and it’s his performance that feels a cut above. 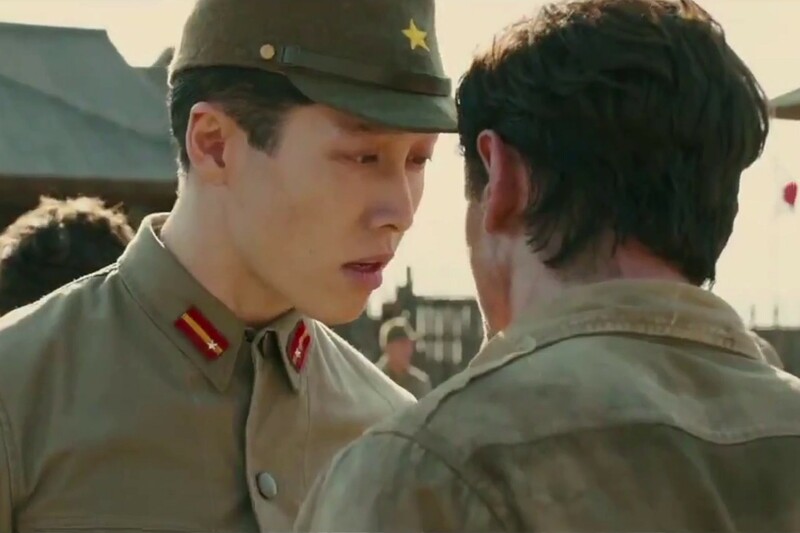 O’Connell has all the boyish charm his role requires early on, when he’s running and attending the Olympics in flashbacks or while entrenched in a WWII air battle. And then when the rickety plane (yes it seems even back then we didn’t provide our soldiers with all the best equipment) he’s aboard crashes into the Pacific, stranding the few survivors in life rafts, the actor inspires with a brave yet calm resolve that proves key to maintaining the sanity of himself and his fellow survivors, “Mac” (Finn Wittrock) and “Phil” (Domhnall Gleason) as they float aimlessly in hope of rescue. This part of the movie is handled well, with no cutaways, no escape from the endless floating along. To keep things moving along as thankfully we don’t go day by day..but rather weeks at a time, this section is filled with a lot of visual action, including a few big flashy storm sequences and some jumpy, although rather cheesy shark encounters. There’s nothing here that we haven’t seen before, but I liked the idea of sticking with Louis for the whole of this long drawn out ordeal as cutting away just might have taken some of the heart and horridness of what they endured out of it. Now if only that was the peak of trials and tribulations for Louis Zamparini right there, it would be a mighty impressive tale of determination and resilience all on it’s own. But it’s barely the tip of the iceberg. From there, Louis is rescued in an ominous scene “I have some good news and some bad news,” he informs his raft-mate, Phil, by the Japanese, who throw him into a POW camp somewhere in the jungle, which proves to be a walk in the park compared to the camp he’s then shipped off to, wherein he meets the movie’s chief villain, Mutsuhiro “The Bird” Watanabe (played scarily so well by Japanese singer Takamasa ‘Miyavi’ Ishihara). Life in the POW camps understandably takes up a large amount of the movie’s lengthy running time (yes it’s 2hrs 20min). The horrors of the brutal imprisonment are put up front and personal without glossing over things too much, but while all the horrible harrowing things that are happening to Louis are quite convincing, the heart-tugging gets somewhat in the way of the real emotional jist of the story. During one of the darkest moments in the ugliest and most dehumanizing of the three POW camps he is sent to, Louis digs deep for the strength he needs to hoist a block of wood over his head in a defiant measure against “The Bird” and O’Connell expresses the emotion well with his face and body, but we also get the obvious with a flashback of a triumphant pre-war Louis at the Olympics. Of course. There comes that bit of cheesy again. 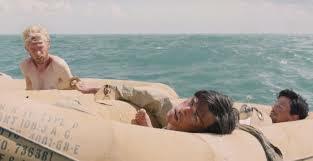 Does it help immensely that Zamperini’s story is one of overwhelming impossible odds, the kind of tale Hollywood loves to tell, yes, yes it does. Because to sum it up, beating up on the movie, tempting as it may be for some, just isn’t much fun. But that alone doesn’t really raise the movie to the level of great, but it does make this heroic tale of the familiar leave a lasting taste with us all. I should really get around to seeing this film at some point soon. I have heard great things about Jack O’Connell’s work in this film. Many seem to think he is going to be a major star one day. As you can tell, I was late seeing this film also!! 🙂 I definitely think O’Connell’s on his way to being one. Him and Taron Egerton from Kingsman. Definitely won’t be seeing this one until maybe it gets on a streaming service. Didn’t really look very interesting to me, even if it was shot by one of my favorite cinematographers in Deakins. It’s a nice story. And yeah I know it’s almost out of theatres being that it didn’t get any noms. so will be VOD soon enough!! 🙂 Kingsman is out on the 13th of Feb so you might be timing that just right! ha! The trailers for Kingsman look really fun. Looking forward to it! And btw, have you seen American Sniper? Saw it and didn’t like it much. Hey James! Yeah I had a hard time on what to rate it also. But the story is just so much of everything..life, war, strength etc..that it was for me..def. worth that. 🙂 Look forward to reading your review when finished! !